We were headed to Sligo, but our first stop was Stokestown – which is one of the places deemed likely as the place our Tanners may have hailed from - and the Famine Museum. The experience was powerful and transformative. The museum is set up in what was once the Mahon family estate, which itself was at the heart of the famine tragedies. Throughout the museum, the story of the famine and its aftermath was told through the voices of the people who lived it via their diaries, letters and manifests, lists, etc.It struck me just how harrowing and tragic the events that unfolded were: what Jim referred to as a ‘perfect storm’of events, habits, attitudes, histories and forces of nature all combined to make an entirely impossible situation. – one that kept going from bad to worse. 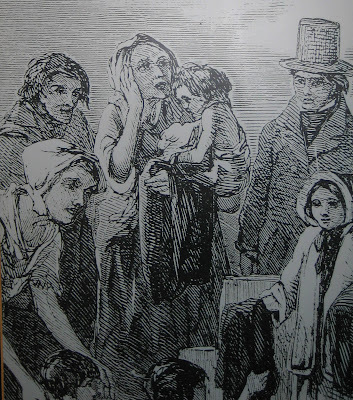 Once the famine took hold, no amount of effort seemed to stem the tide: The population of Ireland (thought to be about 8 million at the time) was reduced by 2 million (to death or emigration) within 5 years. The Mahon estate was at the heart of the madness: the area was struck particularly hard, starvation was rife, efforts to house and accommodate the poor in workhouses was a dismal failure (spreading disease and more misery), and the ‘assisted’ migration of 2000 people to Grosse Isle (Canada), eventually lead to the murder of the landlord, Denis Mahon. The museum is filled with photos, news accounts, and documents, but what really got to me was the lists: particularly, there was a list of about 20 people who were to get a slice of meat at Christmas. On the list were a couple of names crossed off and I wondered the reason. Had they commited some offence? Had they failed to work hard enough? Or had they died? Both Jim and I felt extremely moved and also that we’d learned a lot about a piece of history that is convoluted and still shrouded in opinion, mystery and shame but the real message of the museum is that the history of the famine has distinct relevance to the current state of the world: That same ‘perfect storm’ of conditions exists in the present: the unbalanced distribution of wealth and power; overpopulation; unnatural (and unsustainable) dependence on specific crops; racism; elitism; arrogance and greed. 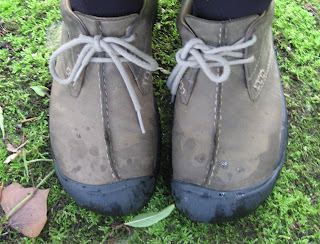 What we learned also gave us pause in thinking about our Tanners. What were the circumstances that brought them to America? What resources (physical, spiritual or mental) sustained them not only through the worst of the famine but through the journey so that they survived - against the odds - as a family of five? 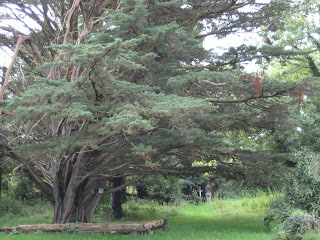 We left the museum and decided to walk through the estate gardens, which provided a welcome – and life-filled- relief. 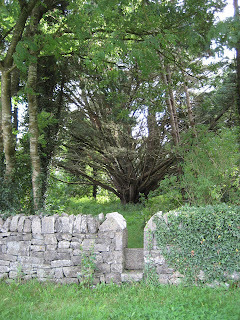 Then headed for the Strokestown Genealogy Centre – which, unfortunately (for us) was closed. 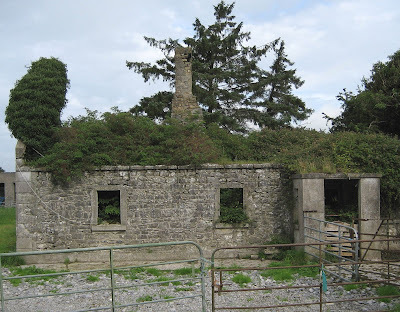 We had a brief discussion about possible locations for our Tanners and before heading off again, I decided to pull out my notes on the Tanners in the area: two George Tanners were listed near Longford – in Ballymacormick, Meelick and Kilcommock, Ards and one near Strokestown in Kiltrustan. I told Jim I’d been able to find all but Kitrustan on Google Maps (I love Google Maps!). 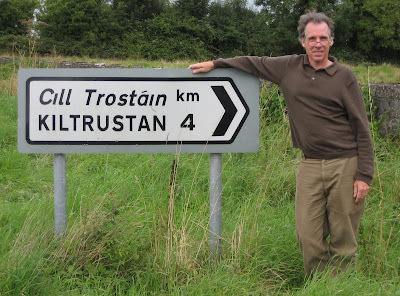 We got back in the car and went no more than 2 miles, when we both simultaneously spotted a roadsign...KILTRUSTAN!. We stared at each other, open-mouthed (which in my cae was rather dangerous, because I was driving). I turned the car around and we posed for pictures next to the sign, then headed up the road to see what we could find. At the top of the road was an old graveyard with a ruined stone building (I suspect the old church) at the centre. We wandered through the gravestones – hoping against hope that we might find a Tanner amongst them. We didn’t, but were still well satisfied and trying hard not to get too mystical about the whole turn of events. 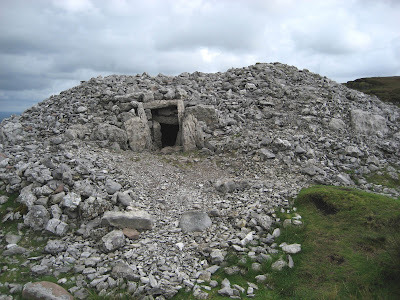 About half-way to Sligo, stands Carrowkeel – an ancient, neolithic cairn site perched in a high valley. We followed (sporadically placed and seemingly contradictory) roadsigns to the site, then proceeded along a dirt track towards the trail head nearest the top of the mountain. 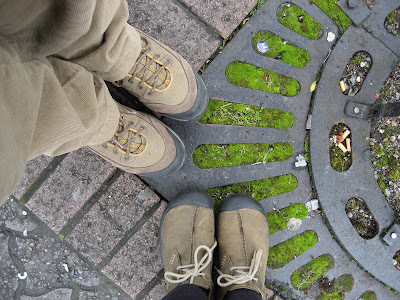 We hadn’t gone far, when we both wished we’d gone on foot. The single track road twisted and turned its way up a steep pass and as we rounded a turn (which featured an alarming drop on one side), the road suddenly dropped down into a steep valley. There was no way to turn back and I was frozen for a moment in fear. I said out loud, I’m scared” which (I'm guessing) did not inspire confidence and caused Jim to sit straight up and turn white, but he kept his (outward) cool and calmly suggested I not proceed. I said, "It's too late" and headed down...all the while thinking...I’m never going to be able to make it back up. Ahhh adventure! Unfortunately for you folks, we were both too gripped coming- and -going to get a picture. Trust me, it would make your hair stand on end! Finally we came to the end of the road and a sign stating that the road was impassable ahead...one can only imagine! 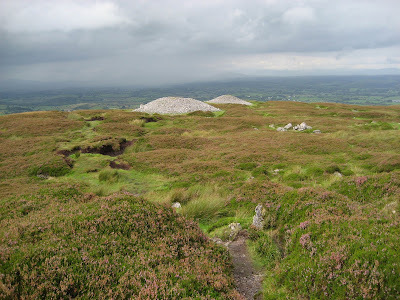 We hiked up the steep hill to the cairns at the top and what opened before us was an extraordinary vista...a landcsape strewn with hills, cairns, lakes & a churning sky as far as the eye could see. It was breathtakingly beautiful- powerful, quiet, wild and remote: the site seems to hover over the surrounding countryside. We explored a number of cairns before heading back to the car, Jim (wanting to live) offered to drive us out again and I gratefully let him. We tackled that hill in style..nearly stalling at the top, but thankfully we made it and have lived to tell (though we did have a few moments of wondering if our Irish adventure was going to end in a heap at the bottom of Carrowkeel)...I guess there are worse ways and places to go! We ended the day in Sligo at the Harbour House backpackers and headed off for a well-deserved dinner and a pint. On the advice of one of the hostel workers, we, found a great pub where Jim got his first hit of traditional Irish music played by a great local crew of players – a concertina, 2 guitars, 2 flutes and a violin. The only trouble? The Irish are night owls and we were to find out that the music scene never gets going until 10pm...too late for us earlybirds – besides, we’re sooooo sleepy. Back at the Hostel, I fell off to sleep listening while Jim read Yeats. Over breakfast on our last morning at Ballycreggan, we chatted with another pair of guests - a mother (Maggie) and her daughter from Dublin. Their family had built Ballycreggan house back in 1903 and it was clear that Maggie felt a bit put out that it had fallen out of the immediate family's hands, but was somewhat appeased by the fact that she really liked Hannah, our proprietoress, the new owner and wife of one of Maggie's distant cousins. Our conversation covered a lot of ground, but Maggie kept coming back to the meaning and purpose of her life. She kept insisting that “her life was her art” and told me she’d once seen an artwork that – at the time- she’d thought rubbish. Regardless and despite her sensibilities to the contrary, the piece stuck with her and had worked its way into her mind a number of times to become – more or less – her personal mantra. The work, done by a German artist had consisted only of the words “Ich bein” scrawled over and over onto the surface of the wall. However, in the years since she saw the piece, Maggie had modified the message somewhat...into Ich Bloody Bein – and from a simple statement almost into a battlecry. Over the next several days and everytime we felt oursleves pushed, Jim & I said “Ich Bloody Bein” to each other (in as Irish an accent as we could muster, then laughed ourselves silly). In Roscommon we stopped at a local history museum/tourist ffice and spoke at length with avid local historian named John. 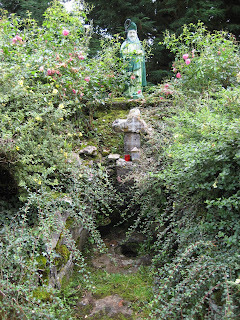 We chatted about our search for ancestors and our intention to visit local ancient sites, but when we told him that we’d stopped at St Patrick’s well, he beamed. As it turns out, the site is a particular favourite of his: a sort of pet project. It lead to a deeper and more interesting conversation about ancestry, local sites of myth, power and magic and coincidence. He told me about an Irish priest who’d become interested in the workings of coincidence and had managed to get permission from his superiors to take a year off from his regular duties to research the phenomena. As we we’re talking, I noticed a large stone nearby, up on a high window ledge and asked what it was. He told me to take a look and I stepped up on a stool placed nearby to have a look. 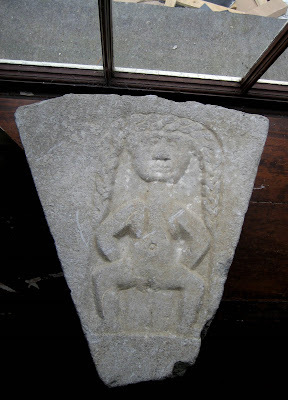 It was a 16th century Sheela-na-gig that had only recently been unearthed in a local churchyard. He said that the stone had been found face down and it was not clear if it had been placed that way to protect it or to condemn it. 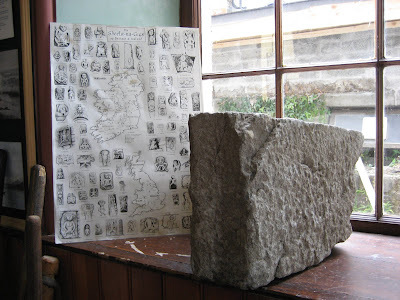 John also told us about a place called the Cruchán Ái Heritage Centre in Tulsk - an archæology/history/mythology centre dedicated to piecing together the multi-layered and multi-faceted story of Cruchán Ái, the one time seat of ancient Kings of Connacht and a place of great power and myth. We decided to head there next. The centre is adjacent to an archeological dig still in progress – so far they've discovered a deposit of bronze age artifacts, which has been layered over by the ruins of an ancient castle, which, itself, has been layered over by a medieval village. As we crossed a small stream on our way back to our car, Jim said something about the marsh mallows he saw growing along the banks. I heard him say, “Marsh men are goats.” which I took to be some sort of mystical shorthand - rife with meaning. I looked around to see what he was talking about and saw Croghan standing nearby with 2 other men. I stood there, perplexed, for a couple of minutes before realising that I’d misunderstood what Jim said. We were about to head off to find the sites, when we realised we didn’t really know how to go, so Jim went back to ask Croghan for more specific directions. He said later that one of the other guys (the moss men) was really having him on – saying that in order to get to the sites, you had to climb through a fence, but watch out for the farmer with a gun, dodge the bull and wait for the ferryman to take you across to the fairy hill. Croghan said it was just past the last house on the road – the one with a front yard full of junk. With our Irish directions clear in our minds (take the first right and go beyond the solstice tree up to the place where Queen Maeve’s bull was stung by a wasp and then take the 2nd left after the fairy stone), and it wasn’t long before Jim excitedly pointed out Rath Cruchán as it came into view: a distinct mound. 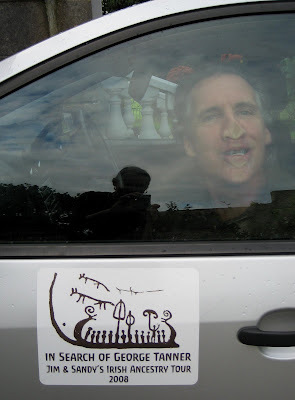 As we turned up the road, Jim spotted a sign for - Rath Beag (SheBeag) – the fairy mound of legend. we scrambled up to look around, inspiring Jim to play the fairies an Irish tune on his flute. We followed our directions up a long, rough single-track road to the end, found the junk-stewn house, then looked around for what might be the cave of the cats. 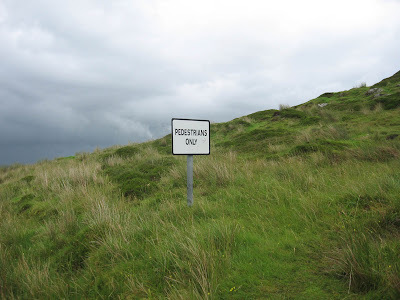 Nothing was immediately apparent - we headed in one direction after the other, across fields of cows and into thickets, when suddenly I got the distinct message that I was not meant to go there. 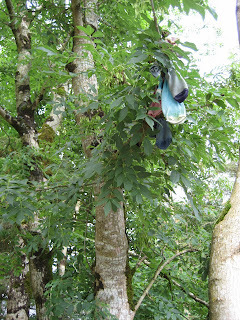 I turned around and headed back for the car, when Jim suddenly spotted the grove surrounding the cave of the cats – it was exactly where Croghan had said it would be – through a gate across from the house with the junk in the yard, but we hadn’t seen it before. Jim went in while I waited. He said it was a deep, powerful and amazing place, but if you want to know more, I’m sorry, but you’ll have to ask him because I wasn’t meant to (and didn’t) see it.. I didn’t even take pictures...neither did Jim. Satisfied, we headed off to find Maeve’s mound – whish was a (relatively) easy task. 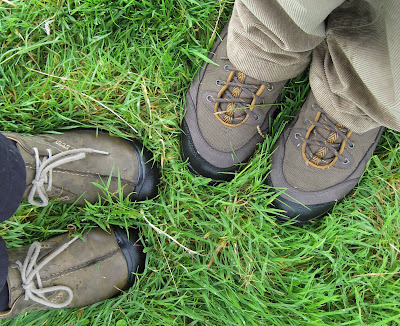 We climbed to the top through fields of grazing sheep and looked out over the beautiful countryside. 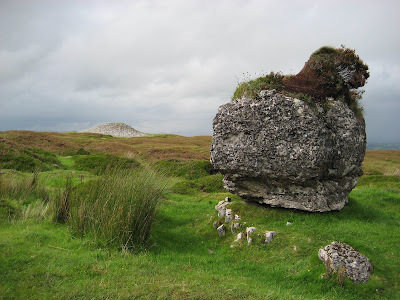 Our next discovery was Ogulla Well – an ancient site, but now heavily overlain with St Patrick mythology and Christian symbolism. 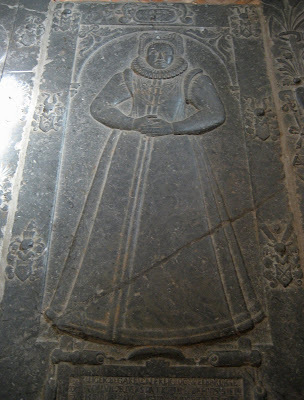 The story goes that the two daughters of Tara’s High King, Laoghaire (the original King Lear), were bathing one morning in the well and St. Patrick happened on them and stopped to chat with them about Christianity. They asked how they could see God. and St. Patrick answered that you can only see God after you die. Story has it that they decided - then and there - to become Baptized and abandon their Pagan ways so St. Patrick then baptized them after which they both died. 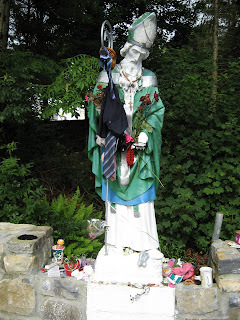 (there's an oddly intangible moral, here)Anyway, there remains at the site, powerful elements of Irish mysticism and folklore which is most evident in the way the site is used: Votive offerings and prayers are draped around the statue of St Patrick and tied to nearby trees (very similar in feel and, I think, purpose to the way Milagro votive offerings are made in Mexico). We left our offerings - lovely cedar incense sent by Kathy - along with the others. 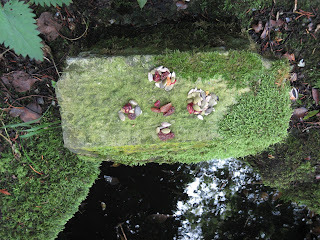 I left mine on a huge and mossy stone at the waters edge. 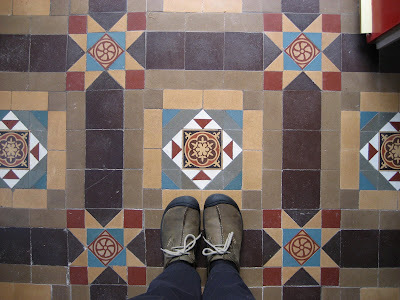 We decided to head back to Ballycreggan House and weariness suddenly hit me. It dawned on me that I hadn’t a clue as to how to find our way back home and realised we couldn’t even retrace yesterdays journey, becuase we’d been lost for most of that, too. Getting lost had been great fun. 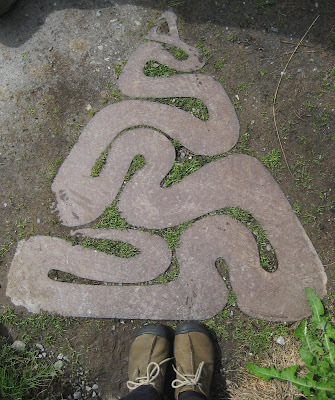 All day we had been getting ourselves lost and found again – all in high humour and good spirits, while stumbling upon magic and mystery all over Roscommon. But now all I wanted was a clear and easy road leading to my bed. After what seemed like an interminable drive and a number of stops for directions, we finally found ourselves home again at Ballycreggan. Time for a glass of wine and a long, deep & dreamless sleep. After Jim’s first Irish breakfast (mine too, but not substantially different from and English breakfast), I presented him with his pilgrimage present – a magnetic sign I’d had made for the car door that read: In Search of George Tanner. 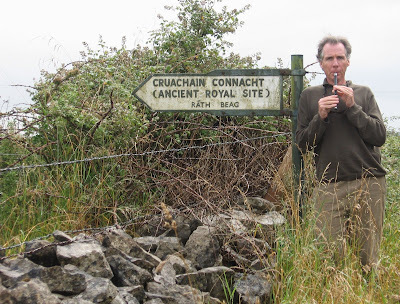 Jim & Sandy’s Irish Ancestry Tour 2008”. I thought he might have thought it tacky, but he was chuffed! We headed off towards the town of Roscommon to get a bead on the local area. According to the Griffiths Valuations of 1848, the Roscommon/Longford area is one of the two most likely locations in Ireland (the other is county Tyrone) that our ancestrors might have come from. Along the way, we found everything charming (especially Jim who even liked the blue metal storage sheds by the side of a barn) and were particularly drawn to old, ruined farmhouse/barn structures, wondering if they are in any way similar - or (against all reason) perhaps the very structures our ancestors may have inhabited. Along the way, Jim spotted a sign for St. Patrick’s Well (just outside Athleague) and said, “Let’s go THERE!” so we turned up the road (in what was to be the first of many unplanned adventures) and drove a few miles - all the way to the end of the road – where another sign for St Patrick’s well pointed us back the way we’d come. We turned around and again came to the other end before spotting anything. 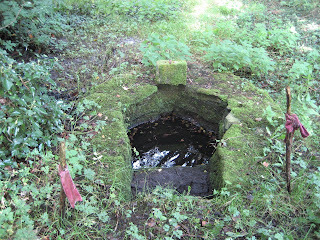 Neither of us was in a hurry to get anywhere particular and we both wanted to find the well, so we turned and headed up the road again and I was just about to suggest that we park the car and walk up and down the road, when Jim said, “There it is”. Sure enough, and not really all that difficult to spot, was a beautiful clearing with 2 huge (and I’d guess ancient) Yew trees. 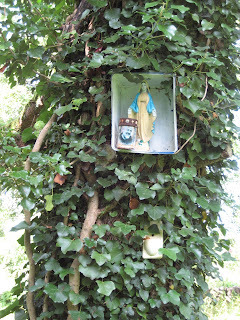 The first part of the clearing was well maintained and contained a small well presided over by a statue of St Patrick as well as a number of other shrines - a small one to the virgin, another featuring Jesus on the cross, another one a sort of plastic encased image (of something now indecipherable) hanging from a tree. 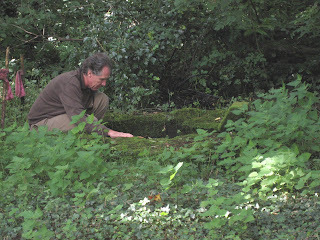 Beyond them all was (for me and most certainly it would seem, for Jim) was the place of real magic: an ancient well under a giant and spreading yew tree. 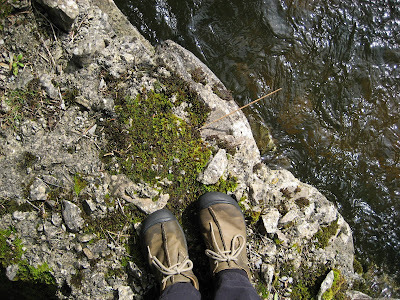 Covered in moss and surrounded by a tangle of overgrowth, it was a quiet and deep place that caught Jim’s attention immediately. He said later that it had almost felt as if he was being drawn there. He sat by the well for several minutes and then asked me if we had any food we could use for an offering. I got a bag of mixed seeds, dried berries and nuts from the car and Jim offered prayers to the five directions and to the ancestors for their guidance and help. He then sang a traditional song about the Irish experience of the famine - of being impoverished and driven from their homeland by starvation and desperation. Given that our ancestors left Ireland sometime during the 1840’s (the height of the famine), Jim’s song very well could define their very experience and by the end of it, I was in tears: feeling very connected to the place and what happened to the people there. He finished his impromtu ceremony with a Lakota song – which brought on even more tears. When he finished, Jim saw I was crying and walked over and put his arm around my shoulder. I had no words. 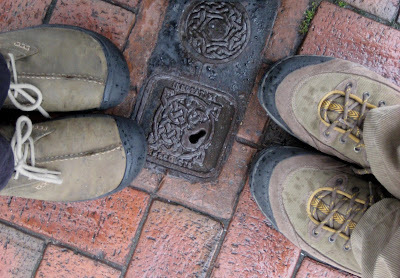 We’re not lost, we’re in Ireland! It was hard to make the transition form Norway to Ireland: I was excited to head off with Jim on our Irish adventure, but I wasn’t yet ready to leave Norway. My plan, to get to Ireland the evening before Jim arrived (early early the next day) was a good one and I’d planned to use the brief time in Dublin to catch upon blogs, email and maybe even some laundry – so I’d booked myself a regular – and anonymous – airport hotel: my only criteria was that they provided an airport shuttle service and free internet. I got what I paid for, but after Norway it felt alien and bleak. I wolfed down a room service hamburger, washed out some socks, wrote a blog, then went to bed feeling a bit down. We gathered up our rental car and headed off towards Tullamore. 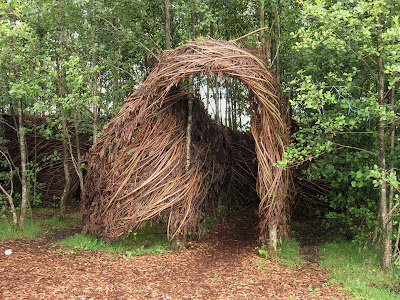 We poked around the town a bit – but nothing seemed to be happening yet so we headed off to Lough Boora Park in search of the Patrick Dougherty sculpture recently installed there. Now, before I go on...a little back story. 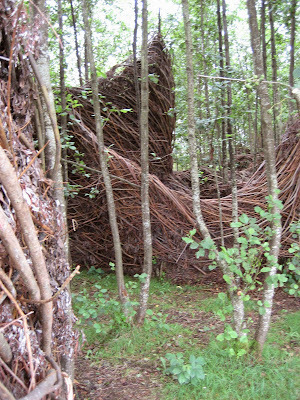 Patrick Dougherty is a sculptor and his work has been a favourite of mine since I discovered it – maybe 5 years ago or so - and I’ve kept somewhat current on his work via his website (see favourite web links at the right). His work has always had a sense of the sacred for me – mostly in that I feel that I can sense the kind of meditative state required to create the work and can't help but imgine where that takes the artist. I’m not entirely sure how to describe it, but his work has a kind of stately quiet to it (even though it’s constructed of a riot of sticks) and also a kind of reverence. All of this – his process, his forms...and the effect his works have on me when I see them, had lead me to think that he might be one of the artists I would ask to interview in relationship to my research: I wanted to know if the act of doing the work brought him any closer to his sense of the sacred. 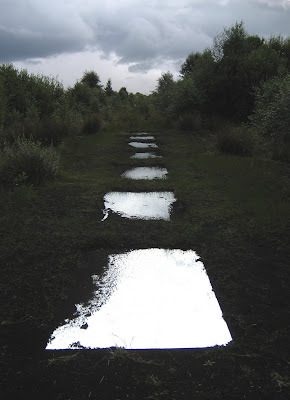 Anyway, about a month before I left on this journey, I was checking in on his website and made a startling discovery: He had just installed a work at Lough Boora Parklands – not 10 miles from my first stop in Athlone, Ireland. I also noticed that the month I’m in Boston (Sept), he’ll be doing an installation just south of Boston and the month I’m in Fort Collins, Colorado (Oct), he’ll be doing an installation in Colorado Springs! This seemed like a nudge...or at least an opportunity not to be missed (actually more like a bit of a jolt) and I emailed him a bit about my work and asked if he’d consider participating in my research. 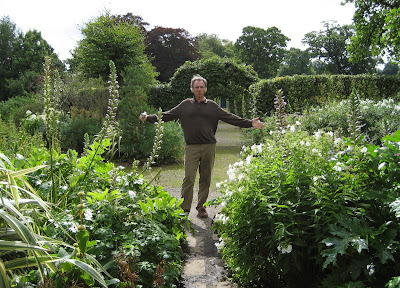 He wrote back – a very friendly email, encouraging me to visit Lough Boora, requesting my feedback and inviting me to contact him when we are both in Boston. I’d also told Jim about his work, sent him the website link and created a new convert – so he was enthusiastic about seeing the work too. We found Lough Boora easily enough – which is pretty amazing seeing as we were dead-reckoning and turning – predominantly – on intuitive leaps. We were only just beginning to realise that signposts and mile markers as we know them don’t really exist – especially in this part of Ireland. 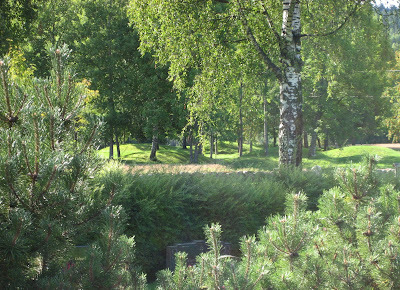 The park is quite strangely beautiful – peat bogs and wetlands have been set aside and a fairly recent addition has been a number of environmental artworks. 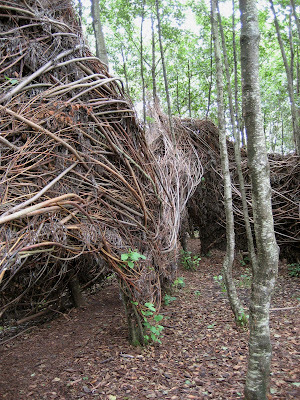 We headed off on the artwork trail and encountered a number – maybe 7 or 8 – before reaching Patrick Dougherty’s piece. Some seemed to me to embrace what I would consider essential in a successful environmental work of art: that is that defines some clear relationship with and that it works some magic on the environment it’s in. A couple stand out in this regard: in particular, a pice consisting of seven mirrors place in the ground, reflecting the sky like water. 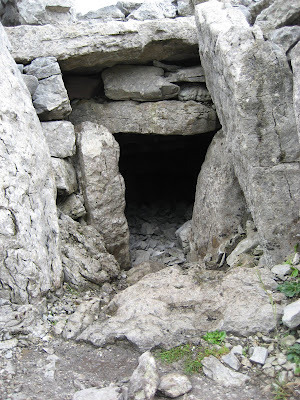 Another was a triangular shaped enclosure, with a defined a threshhold you pass through to a sacred space within. But, I have to admit, I gave neither of these pieces the attention they probably deserved, because I was so driven to find Patrick’s piece. To finally see one in the real. Finally, we caught sight of it (Jim first, actually). Nestled in small stand of trees was what I can only describe as a organic longhouse-nest for humans. 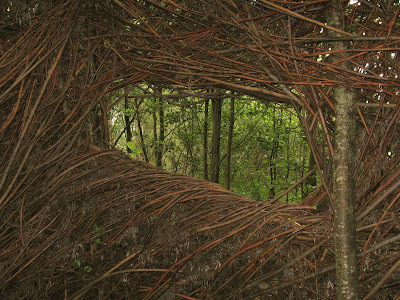 Woven entirely of saplings, sticks and branches, the work forms an intricate, irregular and meandering tunnel through the trees. It seems to draw you deeper into itself and every now and then, the weaving defines a kind of doorway or window that directs your travel or your gaze outward again. 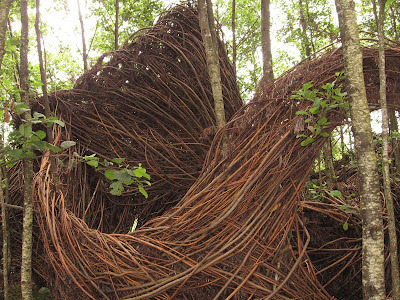 The work seems to reflect the relationship between nature/environmnt and quiet human industry – it is similar in feel to an intricate labyrinth of ant tunnels or an elaborate nest. I’m not sure my words can do the experience of this work justice: It was (is) absolutely enchanting, somehow comforting and grounding, yet magical and very moving. At one point, quite moved by the work and my experience of it (which in relationship to things referred to as art is fairly rare for me) I said out loud, “This work makes me feel proud to be an artist”. 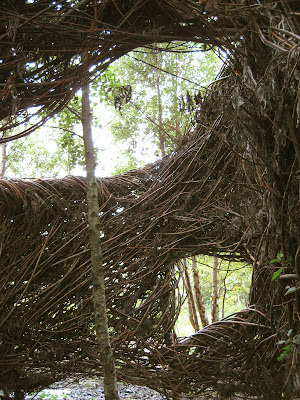 Thank you Patrick Dougherty for your stunning sensibilities and vision. I can’t wait to meet you. It was hard to leave the work behind, but we went on to find our first night’s accomodation, becoming almost immediately and somewhat hopelessly lost. 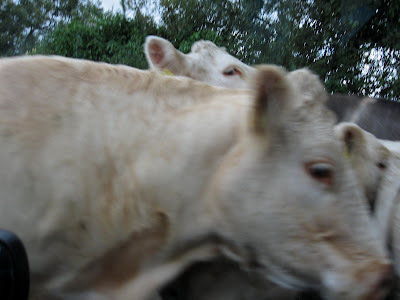 We found ourselves on a single track road with an approaching herd of cattle. 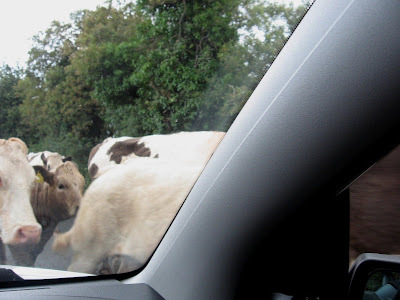 We pulled over as far as we could and the lead farm boy said, “Pull in your mirror!” Good thing, too or we would have lost it as the cattle rumbled by bumping the car and shaking us all around. Jim said, “Now I know I’m in Ireland!” A few miles on, totally lost but not particularly concerned, we pulled over to ask a local man directions to our B&B. He asked if we were lost and I said, We’re not lost, we’re in Ireland!”. He laughed his approval then gave us the list of lefts and rights at the crossroads, by the church, after the shop and over the hill that saw us all the way to our beds and clued us in on our next few days of navigating around Counties Roscommon and Sligo: roadsigns are few and far to come by, directions are complex and what you end up finding have that ‘we were meant to find this feel’. 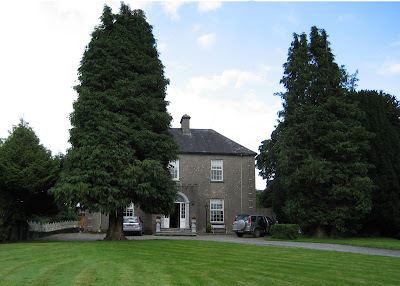 Pulling up to Ballycreggan House was a relief and a wonderful surprise: The restored manor house is likely to be our flashest accomodation in Ireland, but it felt wonderfully welcoming. We decided to celebrate our real arrival in Ireland with a glass of wine out on the long front lawn....that is, until the heavens opened and we had to run inside out of the rain. 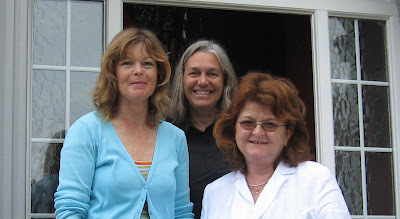 Even though I've been in Ireland for a few days already, I can't move on from my Norway posts without thanking Elisabeth Holm, my gracious-vivacious-wondrous host at ElleVilla and new dear friend. Elisabeth, I meant what I said...Please come spend Christmas with us in Australia, where I promise to take as good care of you as you did of me. But, most of all, Thank you for your friendship..I hope to know you (better & better) for a long, long time - at least until we're old ladies with funny hats (which for me isn't all that far off!). See you in Australia in December! I'm so grateful to Elisabeth (my former hostess, now adopted daughter-friend) for setting in motion the next bits of my journey. On her suggestion, I made contact with a wonderful woman named Aine Aske at the Larvik Museum. Aine is the Cultural curator/historian for Larvik - so the perfect person to ask questions about my ancestors and their history. 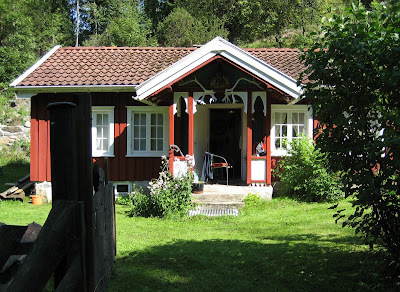 As I mentioned briefly before, Aine was immediately very helpful, but she suggested I contact a man name Tor Bjørvik, an avid local history buff for some even more in-depth help with records. I emailed Tor and he wrote back that genealogy wasn't his real specialty, but he'd ask another man - Kolbjørn Næs - if he would help me. Kolbjørn emailed me and we made a date to meet up on Saturday to go through the available records..and to try to sort the puzzle of who came from where, with whom and what for...and all that. 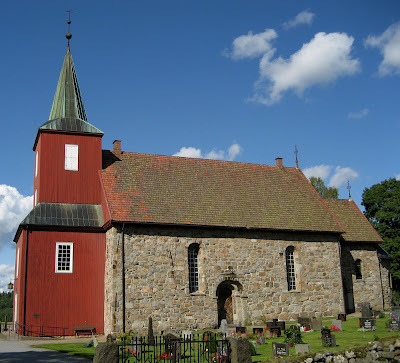 We were to meet up in Hedrum - which I thought I thought I could walk but turned out to be about 20k away, so Elisabeth took charge and asked her father, Olaf Holm to give me a ride and - along the way - to show me the Hedrum church, where Kristen Tolstrup's children were all baptised. 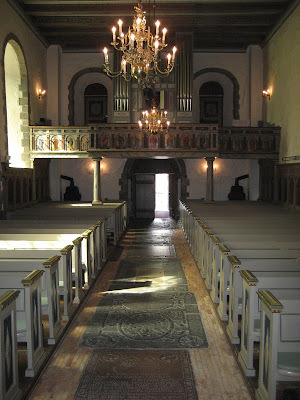 Hedrum Kirke is famous for it's exquisite interior, parts of which date back to the 12th century. Olaf has a particular fondness for the church because, for the last few years he's been the bell-ringer (this must be a dying art). Now for those of you who knew my Dad, Olaf reminds me a lot of him - a very straight-forward, intelligent, saavy, modern business man - not exactly what I'd think of as a bell-ringer type. 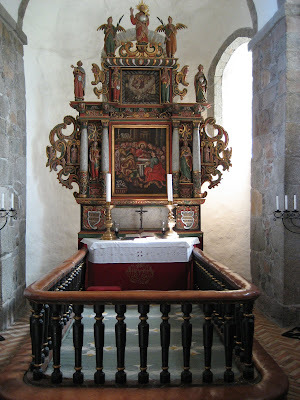 On the way he showed me the house he was born in, where his parents hid from the Nazis (his father was a priest and therefore a particular target) and then showed me the interior of the Hedrum Kirke (as bell-ringer, he has keys). It was magnificent! Honestly, I've seen some huge and amazing cathedrals, but nothing more powerful than Hedrum Kirke. And like all really sacred-feeling churches, it was built on a sacred site recognised by prior generations: At the back of the churchyard there are Viking burial mounds - dating to the 500-900's or so, and recent archeological digs nearby have revealed even earlier use with the discovery of bronze and even iron age artifacts. 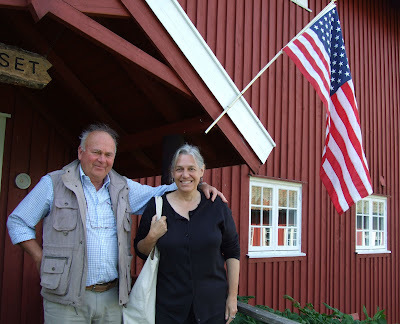 We arrived at Hedrum Bygdetun (an old town square used by the local historical society as their base of research operations and for historical events) and Kolbjørn had raised an American flag in my honour! I can't begin to describe how touched I've been by the willingness and enthusiam of strangers to help me with my search. 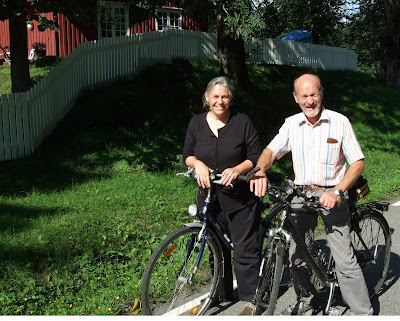 Kolbjørn and I started to comb the records and shared bits of information back and forth. 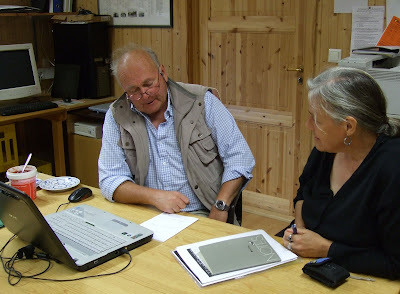 I was happy to be able to contribute pieces of the puzzle by alerting Kolbørn to some records that Kolbjørn hadn't seen - the 1801 census, for instance (discovered by Dave) and the names of the ships Mathias captained (gleaned from my meeting with Ruth Eli). I became aware that I was playing a very particular role in the process - as a kind of weaver of the various pieces and sources of familty history. Kolbjørn was able to put a lot of information into historical perspective by interpreting the records in ways that made sense of and filled out the dry and simple lists of dates, places, and other entries. Turns out, both Kristen (gr-gr-gr-grandfather) and Mathias (gr-gr-grandfather) were very wealthy men and Kristen, quite possibly was the administrative overseer for the Hedrum Ironworks: you'll like this, Max - Hedrum Ironworks was connected to the Larvik Ironworks, but was where they specialised in forging metal for blades. The records were definitive that Kristen was born in Tolstrup (near Aalborg) Denmark and that he lived and worked in Hagnes (near Larvik). 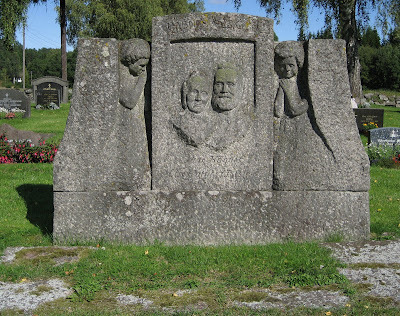 In 1809, he married Maren Mattisdatter from Skoli (or Scholi) near Andebu and they had 5 children, all of whom were baptised in Hedrum Kirke –3 daughters, Line Magrethe, Maren Petrine and Else Katrine and 2 sons, Kristen (who died unmarried and without children at the age of 24) and Mattis (my ancestor) who was a sea captain. In a footnote, the entry also mentioned another son, Peder, born out-of-wedlock before Kristen married Maren. Peder Christensen seems a pretty interesting fellow: Though not raised by either his birth mother or father (he was fostered out to a farm), he was self-taught and educated, became a sea captain and at the age of 50 (unmarried and childless) he wrote a book about his life and sea-faring adventures. Ruth Eli told me that Mattis' first experience as a sailor was as a navigator on a ship captained by Peder, his illegitimate half-brother. I hope this means that, at least, there was no bad blood or resentment between Peder and his half-siblings. This, along with the fact that he was well educated, gives me reason to think (or maybe, hope) that Kristen looked out for him, somehow and tried to give him opportunities he might not otherwise have had. I’d like to get a copy of the book (and learn to read it), because maybe there’s some more personal and individual history there - a sense of who all the people really were. Kolbjørn and I covered a lot of ground and ended our research session with the arrival of Tor Bjørvik who came to take me on a tour of the locations where my ancestors lived and worked. 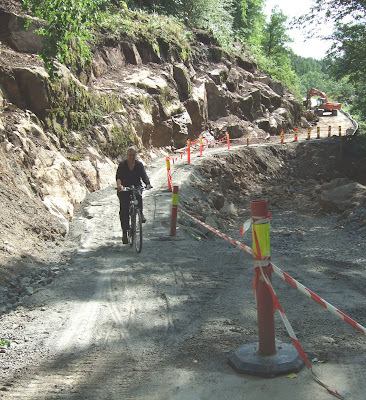 He asked if I was able to ride a bicycle (Chris, I know you're smiling now): it seems that one of the roads we needed to travel was in the midst of roadworks and closed to traffic. I said that was fine (but not without a moment’s trepidation – I haven’t ridden a bike in probably 20 years!) and I’ll admit that the bike (and I) felt pretty unsteady at first...besides which I needed to walk the bike up some of the steeper hills, and down some of the most slippery trails...but we were all the while passing through some incredible ancestral countryside and soon came to our first stop - Hagnes Nedre Verket (Hagnes lower ironworks) – the ironworks site where Kristen Tolstrup worked and the very house where he lived during the early part of the 19th century. I think it’s extraordinary that the house is not only still standing, but still inhabited. The man who lives there was mowing his lawn and when Tor told him why we were there offered to let us look inside. Tor then showed me the point on the river where the forge had been - an exquisite place, with a small waterfall to drive the water-wheels (no longer there). 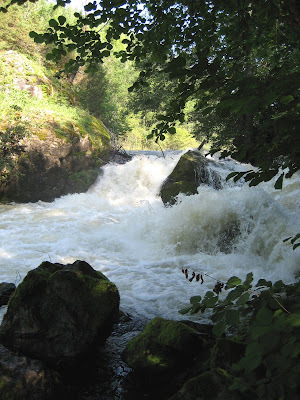 The water flowing was particularly heavy because there’d been so much recent rain. The beauty of the place and the power of the water was stunning! We got back on our bikes and by this time it was feeling like an adventure..seriously winded or not, the day was perfect, the discoveries compelling and the experience entirely engrossing. Our next stop was the Hagnes Østre Verket – the upper Hagnes ironworks. The property is now owned by an extended family: the first house – which was part of the ironworks, is now being renovated and occupied by a young couple. We met the husband by the side of the road and Tor told him why I was there. I asked if the house had any ghosts and he said that he was pretty sure there was a spirit in one part of the house, but hadn’t dared to tell his wife. He said the spirit seemed friendly enough, though and I said that maybe it was my gr-gr-gr-grandfather! 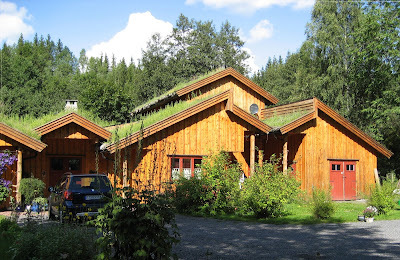 We went on to the river’s edge where the parents of the young husband we’d met had built a huge, gorgeous house with sod roofs. Honestly, it was one of the most beautiful houses in one of the most stunning locations I’ve ever seen. Back on our bikes and back to our starting point...and all too soon, the adventure was over! I was genuinely sorry to see it end. On our way back to Larvik, I asked Tor if we could stop again at Hedrum Church so that I could photograph the gravestone of Kristen’s sister, Else Katrine Tolstrup. Kari had said the day before that she thought Kristen and Maren Tolstrup might be buried there, too. 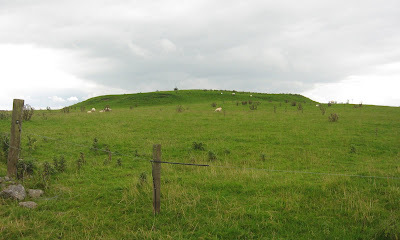 This time, too, I was taken by the Viking burial mounds just beyond the churchyard and can’t help but think about the power certain sites seem to have to inspire a sense of the sacred in succesive and often quite disparate cultures. Once again, I am struck by a sense of absolute gratitude for being here, now, doing this: and as well, for all of the help, good will and friendship that’s been offered me. I would never have come so far in my efforts to locate past and present family, to learn their stories and to piece together our history without it. Thank you Elisabeth, Thank you Aine. Thanks for your good humoured and inspired research Kolbjørn and Thank You Tor for your graceful, soft-spoken companionship and an unexpected adventure. What can these stones be?